The blessing ceremony of the CMA CGM MARCO POLO took place today in the DSME (Daewoo Shipbuilding and Marine Engineering) shipyard. The ceremony took place in the yard where the vessel was built, and was attended by senior managers from DSME, Ludovic Gérard, Vice-President CMA Ships, Sang Ryul Kim, CMA CGM KOREA, Jean-Baptiste Vibert, Newbuildings Manager, Benoît Drevet, Superintendent of the vessel, the Captain Velibor Krpan and all his crew. 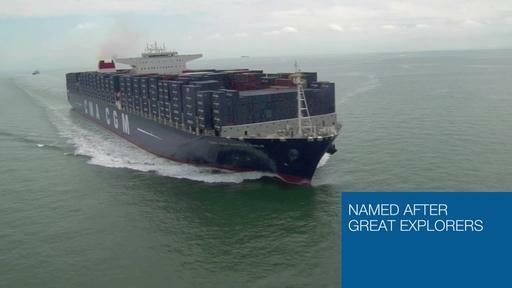 After the speeches, the vessel’s godmother pronounced the traditional phrase: “I name this ship CMA CGM MARCO POLO, may god bless her and all who sail on her”, before launching the bottle of champagne which broke against the hull on the first swing, a sign of good fortune to come for the ship and her crew.